The veg growers among you will have been fervently sowing, pricking out and potting up all spring. No doubt courgettes will have featured on your ‘to grow’ list, but what about their larger than life cousins, pumpkins and winter squashes? Our bet is, that once you’ve tried them they’ll be a kitchen garden essential. Now is the time to move these tender veg outside, so begin hardening off your plants in preparation. Huge pumpkins are addictive things to grow – varieties like ‘Atlantic Giant’ or ‘Hundredweight’ can reach 20lbs if you neglect them, 200-300lbs if you nurture them, and an eye-watering 2,000lbs if you conceive a record breaker. 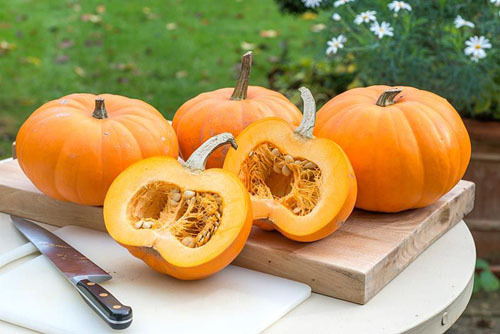 Switzerland’s Beni Meier is the current World Record Holder (2,323lbs) but while he may have relied upon a polytunnel, daily nutrient tests and mycorrhizal fungi inoculants to gain his showstopper, how can the average grower produce a pumpkin to be proud of? Warmth and water are the two secrets – choose the sunniest, most sheltered spot you can afford, and enrich your plot with ample organic matter which soaks up moisture like a sponge. Sinking an upturned bottle (base removed) next to each plant is a handy way to deliver water straight to the roots. Once the first fruits have set to the size of a grapefruit, remove all but the strongest one or two. Feed regularly with a balanced liquid fertiliser, and water copiously. Allow the meandering stems to root where they lay – this strengthens the vines even further. And (we’re not kidding) cover your pumpkins up with a blanket at night – which keeps them warm and allows them to pile on those crucial pounds. This entry was posted in Plant focus on May 28, 2015 by gapadmin. 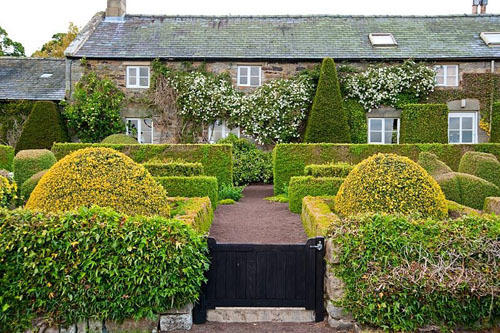 Herterton House is nestled in the small Northumberland village of Hartington, two miles north of Cambo. Widely acclaimed as a classic of 20th Century garden design, this lucidly structured one-acre garden on a difficult, windswept site is a brilliant synthesis of influences as diverse as the paintings of Paul Klee, the patterns of oriental carpets, William Lawson’s 1618 work ‘The Country Housewife’s Garden’, and the ideas of horticulturalists Marjorie Fish and Graham Stuart Thomas. 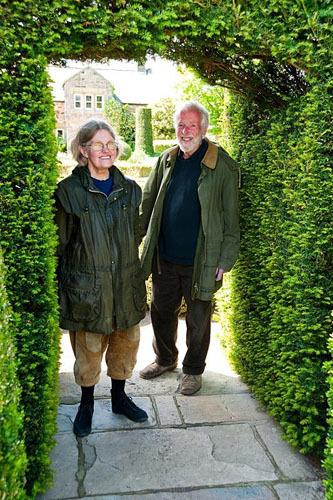 Now owned by Frank and Marjorie Lawley, five distinct garden enclosures wrap around the house within the one-acre grounds. 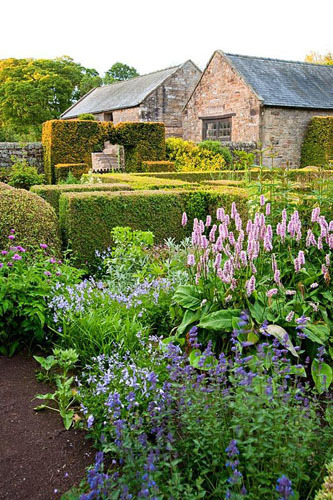 All are quite different yet cleverly linked by repeated use of various clipped forms of box, yew and holly – the flower garden, the fancy garden, the formal garden, the physic garden and the nursery garden. The flower garden is home to a vast collection of herbaceous perennials, making this a true plantsperson’s paradise. 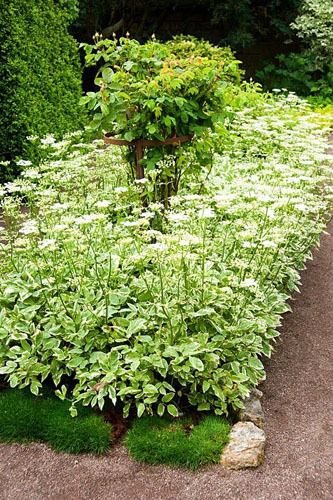 Strong, rectangular blocks of yew and box act as backdrops and dividers for sweeping plantings of persicaria, viola, centaurea, geranium, geum and poppies. Box spirals bring permanent height to the area, and a stone birdbath reinforces the fact that this is an abundant garden, both in terms of species of flora and fauna. The perennials weave through each other in beautiful, colour-coordinated swathes. When you walk into the fancy garden, the view is instantly impressive – and a photographer’s dream. 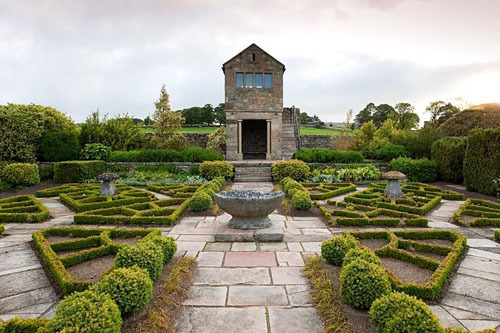 Metre upon metre of meticulously clipped box parterre is woven into a Tudor rose pattern. With simple gravel and paving in between, this creates a confident, bold design. Strategically placed staddle stones lead the eye, and the stone gazebo is home to symmetrically display photographs showing the evolution and maturation of the garden over the decades. At the front of the house, the formal garden shows how, through the subtle differences of colour, texture and shape, you can rely on the impact of topiarised evergreens to add drama and personality to a property. A large pair of globed Buxus sempervirens ‘Aureovariegata’ are framed by low box hedges infilled with Dicentra formosa. A simply black solid gate leads you up the main path, where the stonework of the house is broken up by columnar yews and a solitary Clematis montana. The nursery garden is crammed full of regimental stock beds from which plants are lifted each day for sale. 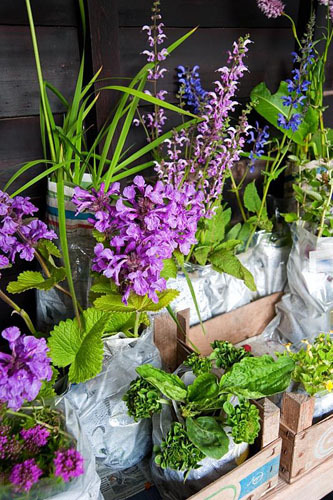 Carefully wrapped in newspaper and then in a clear polythene bag, the perennials sold include some choice rarities as well as more familiar species. The gardens are open daily, except Tuesdays and Thursdays, between the months of April and September, so owners Frank and Marjorie are kept incredibly busy stocking up the plant sales area. In early June beds in the physic garden are edged with the pink fizz of Saxifraga ‘Clarence Elliot’ with a monolithic clipped silver pear, Pyrus salicifolia, at its centre. The hot pink of the saxifrage provides one of the strongest blocks of contrasting colour to the gardens, quite different to the subtle variegation of Aegopodium podagraria ‘Variegata’ which spreads to fill one of the nearby herb beds. Many other medicinal and culinary herbs grace this garden area, too – monarda, thyme and hyssop to name just a few. This truly is a plantsperson’s garden packed with interest and inspiration. View the full feature here. This entry was posted in My favourite on May 26, 2015 by gapadmin. Water always features strongly in show gardens, and this year was no exception. 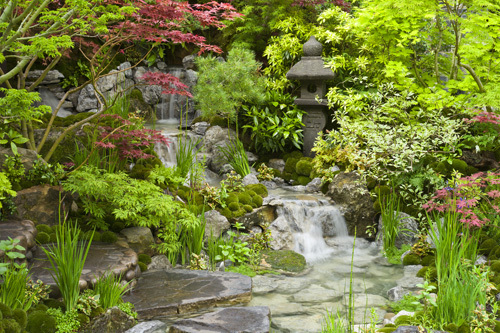 Tasteful rills and reflective pools were plentiful, yet some designers pushed the boundaries to bring new, innovative ways to incorporate this element into their gardens. 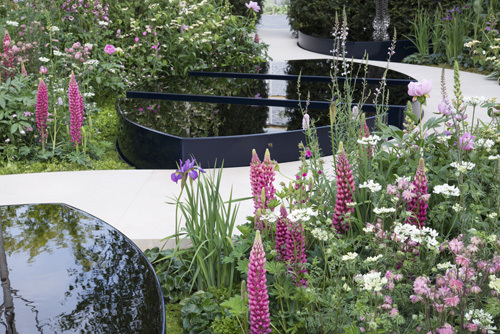 Cleverly incorporated into a smaller space, Ruth Willmott’s black, reflective pools of the Breakthrough Breast Cancer Garden show how you can balance water and plantings perfectly. 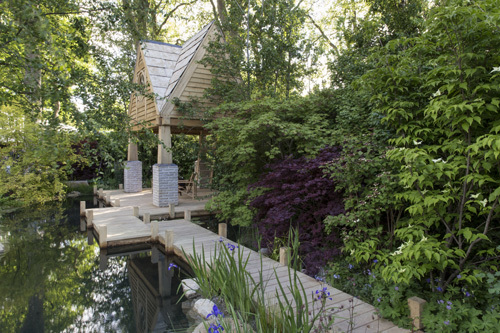 The ratio of pool to planting is also expertly executed in the M&G Garden, where Jo Thompson’s boardwalks sit above a central swimming pond. No one element dominates. Beyond our Borders, designed by Sarah Eberle, uses striking pure aqua pools to represent oceans through which plant ailments can enter our countries. A gentle jet of water creates evolving, mesmerising ripples of sand. Kazuyuki Ishihara shows how water can be subtle in appearance, yet crucial to a soothing design formed of water-worn cobbles and globes of moss, in the Edo no Niwa garden. The result is an incredibly tranquil retreat that looks especially tempting after a day on your feet. A water wall formed of nylon string cloaked in continual droplets, constructed in the Thinking of Peace garden, is also incredibly calming. The garden that makes the stongest use of water, though, is Fuminari Todkak’s Personal Universe garden. The prominent element – a cylindrical waterfall, suspended in mid air – show how exciting the addition of water can be to a garden. There is no escaping the sights and sounds that this material can bring. This entry was posted in Garden Shows on May 23, 2015 by gapadmin.